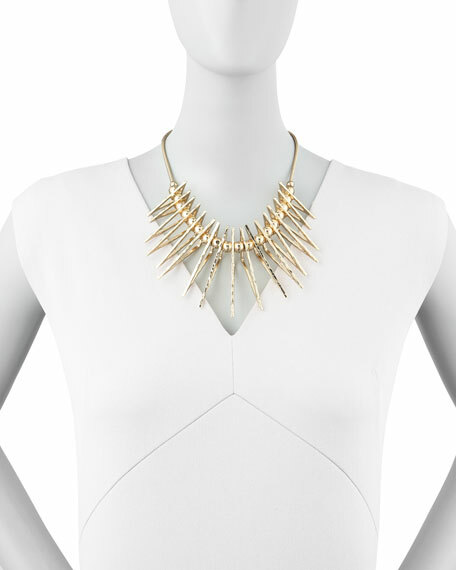 Glamorous with an edge, this Jules Smith necklace hits its sartorial target with peaked triangle spikes. Round beads separate hammered triangle pendants. 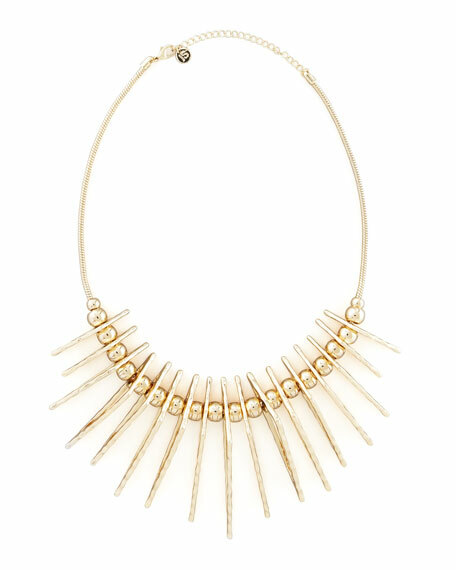 Triangular pendants form peaked spikes, 3 1/4" drop. Coil chain necklace, 6 1/2" drop at longest. Lobster-claw clasp with 3" chain extender. Gina Nigrelli-Smith, founder and lead designer of Jules Smith accessories, looks to the past to create stylish, modern jewelry. Inspired by the iconic women and style trends of the 60s, 70s, and 80s, Nigrelli-Smith reworks those decades into gold-plated bangles, chandelier earrings, bold necklaces, and jelly bracelets that have been spotted on celebrities and style blogs. This eclectic mix is influenced by the designer's time spent living in New York City, Zimbabwe, and the Caribbean, lending the entire Jules Smith line a sense of worldly sophistication and easy charm.